Canada's Prime Minister Justin Trudeau listens while addressing the final news conference of the G-7 summit in the Charlevoix city of La Malbaie, Quebec, June 9, 2018. U.S. President Donald Trump said Saturday that he had instructed his representatives not to sign a communique by all seven leaders attending the G-7 summit in Canada, citing statements by Canada's Prime Minister Justin Trudeau made after he left. "Very dishonest and & weak," Trump tweeted in response to Trudeau's remark that the new U.S. tariffs on aluminum and steel were "insulting." "Based on Justin's false statements at his news conference, and the fact that Canada is charging massive Tariffs to our U.S. farmers, workers, and companies, I have instructed our U.S. Reps not to endorse the Communique as we look at Tariffs on automobiles flooding the U.S. Market!" Trump added. "International cooperation cannot be dictated by fits of anger and throwaway remarks," French President Emmanuel Macron's office said in a statement about Trump's withdrawal from signing the communique. The statement also said Trump's action is a display of "incoherence and inconsistency." "Germany stands by the jointly agreed communique," Germany spokesman Steffen Seibert said in a statement. Trudeau closed the summit Saturday by refusing to budge on positions that place him at odds with Trump, particularly new tariffs on steel and aluminum that have irritated Canada and the European Union. He said in closing remarks that Canada would proceed with retaliatory measures on U.S. goods as early as July 1. "I highlighted directly to the president that Canadians did not take it lightly that the United States has moved forward with significant tariffs," Trudeau said in the news conference following the two-day summit. "Canadians, we're polite, we're reasonable, but we will also not be pushed around." British Prime Minister Theresa May echoed Trudeau, pledging to retaliate for tariffs on EU goods. "The loss of trade through tariffs undermines competition, reduces productivity, removes the incentive to innovate and ultimately makes everyone poorer," she said. "And in response, the EU will impose countermeasures." 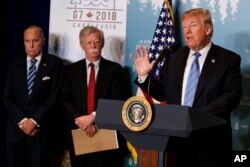 White House chief economic adviser Larry Kudlow, left, and national security adviser John Bolton look on as President Donald Trump speaks during a news conference at the G-7 summit, June 9, 2018, in La Malbaie, Quebec, Canada. Trudeau and May also bucked Trump on another high-profile issue: Russia. Trump wants to have Russia — which was pushed out in 2014 over its aggression in eastern Ukraine — rejoin the group. Trudeau said he was "not remotely interested" in having Russia return to the group, made up of the world's seven most advanced economies. May added that she also welcomed the G-7's recognition of the need to continue sanctions on Russia, given "Russia's failure to fully implement the Minsk agreements" of 2014 that were meant to end the war in Ukraine. "We have agreed to stand ready to take further restrictive measures against Russia if necessary," she said. Before leaving the summit Saturday, Trump said there must be "fair and reciprocal" trade between the U.S. and other countries. "The United States has been taken advantage of for decades and decades and we can't do that anymore," he told reporters shortly before leaving the summit for Singapore, where he will meet next week with North Korean leader Kim Jong Un. Trump said many "unfair foreign trading practices" are getting "straightened out slowly but surely." He blamed past U.S. leaders for the current global trade landscape and congratulated other world leaders for "so crazily being able to make these trade deals that were so good for countries and so bad for the United States." Trump declared "those days are over" and said that talks this weekend with G-7 leaders convinced him they are "committed to a much more fair-trade situation for the United States." German Chancellor Angela Merkel watches as President Donald Trump talks with IMF Managing Director Christine Lagarde during the Gender Equality Advisory Council breakfast during the G-7 summit in Charlevoix, Canada, June 9, 2018. At a bilateral meeting Friday with Trudeau, the U.S. president joked that the Canadian prime minister had agreed to "cut all tariffs." Despite the two leaders exchanging criticism of each other's trade policies the previous day, Trump described the cross-border relationship as very good, stating "we're actually working on cutting tariffs and making it all very fair for both countries. And we've made a lot of progress today. We'll see how it all works out." In a subsequent sit-down meeting with Emmanuel Macron, Trump said the French president had been "very helpful" in efforts to address trade deficits with the European Union. Macron responded that he had a "very direct and open discussion" with Trump, and "there is a critical path that is a way to progress all together." Canada's foreign minister, Chrystia Freeland, confirmed she met Friday with U.S. Trade Representative Robert Lighthizer to discuss the tariffs and the fate of the North American Free Trade Agreement (NAFTA). She said Canada, however, would not change its mind about the U.S. steel and aluminum tariffs, which she termed "illegal." Trump imposed the tariffs on the ground that weak domestic industries could affect U.S. national security. ​Canada, Mexico and the European Union are introducing retaliatory tariffs. 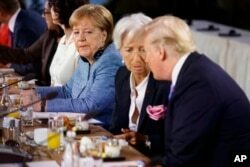 "I think the only way this moves toward a deal is if the concern grows among the G-7 countries about the economic impact of this, that Trump begins to feel some pressure from farmers and small manufacturers and others that are harmed, that other countries are feeling the pressure from the decline in their steel and aluminum exports to the United States and it causes some reconsideration of the current positions," said Edward Alden, a senior fellow at the Council on Foreign Relations. Canada's Prime Minister Justin Trudeau speaks as France's President Emmanuel Macron, Japan's Prime Minister Shinzo Abe, Germany's Chancellor Angela Merkel and other attendees look on at a G-7 and Gender Equality Advisory Council meeting as part of a G-7 summit in Charlevoix, Canada, June 9, 2018. On the eve of the summit, Trump had lashed out on Twitter at Macron and Trudeau, who had criticized Trump's trade stance at a joint news conference Thursday in Ottawa. The White House then announced Trump would skip some of the G-7 sessions and depart for Singapore on Saturday morning, several hours earlier than planned. Trudeau, alongside Trump, was asked if he was disappointed the U.S. president was leaving early. He did not reply, but Trump grinned broadly and said "he's happy" before appearing to stick out his tongue. Some attending the summit were openly expressing strong concern about Trump's positions. "What worries me most is that the rules-based international order is being challenged," Donald Tusk, the chairman of European Union leaders, said at a news conference just prior to the start of the G-7 talks. "Quite surprisingly not by the usual suspects, but by its main architect and guarantor — the United States. Naturally, we cannot force the U.S. to change its mind." "The United States accounts for more than half of the GDP of the total G-7. So, without the United States, the G-7 really isn't anything," according to Sebastian Mallaby, a CFR senior fellow for international economics. When asked about Russia on Saturday in Quebec, Trump said, "I think it would be good for the world. We're looking for peace in the world. We're not looking to play games." Trump: This Used to be The G-8. Not the G-7. One other G-7 leader, Italian Prime Minister Giuseppe Conte, said Friday in a tweet that he supported Trump's suggestion. European Union leaders are in agreement "that a return of Russia to the G-7 format summits can't happen until substantial progress has been made in connection with the problems with Ukraine," German Chancellor Angela Merkel told reporters. "Russia is focused on other formats apart from the G-7," Peskov said, according to the Sputnik news agency.